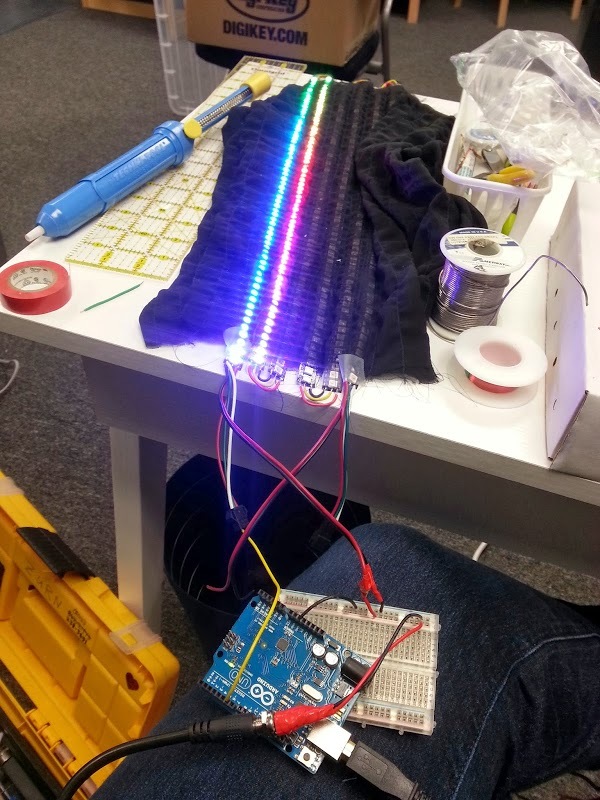 LED Dress With Message #WearableWednesday « Adafruit Industries – Makers, hackers, artists, designers and engineers! Brooks Zurn has created a sizzling dress with an LED matrix that can display words, inspired by the famous Twitter Dress. With some help from her friends at FamiLAB in Florida, she’s got 576 neopixels glowing. I used 4 of the Adafruit 144 LED’s/meter neopixels. The full meter consists of two strips soldered end-to-end, so I de-soldered it in the middle to create the segments. After thinking of a few different approaches, a friend advised I sew sleeves for the strips , and then attach those to the garment. Then I found Adafruit had a Neopixel matrix library. It had a variable that could be changed for end-to-end, so I adjusted that. After that, it just worked! When asked about the micro-controller and power supply, Brooks had some unexpected answers. I actually used an Arduino Uno, because I wanted to make sure it worked before sewing anything. I found that 576 neopixels all on at the same time used a lot of current — approximately 18mA/neopixel. So, one of my friends had some good suggestions: don’t turn them all on at once, keep them set dim, and use a more powerful battery. I used a tablet/ laptop USB power supply and stripped one end of a USB cord so I could plug the battery into the Arduino. Then it worked. Brooks is also working on her own wedding dress, which promises to be quite illuminating. Stay tuned! SO COOL!!! Can’t wait to see her wedding dress! !